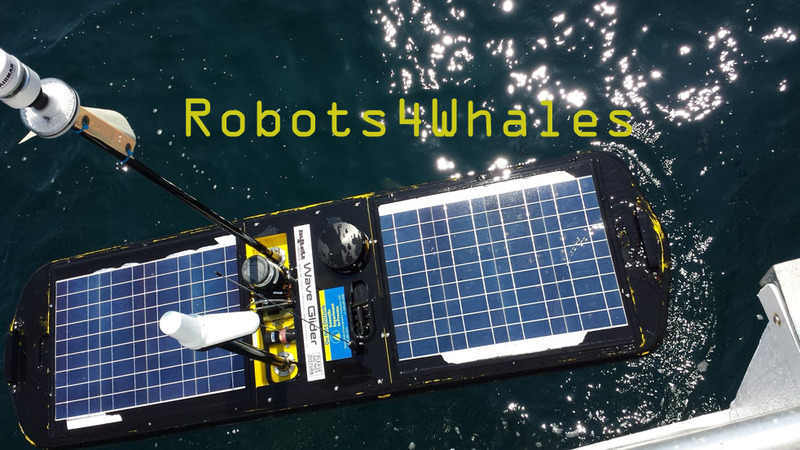 Welcome to Robots4Whales, the website for the autonomous platform operations of marine ecologist Mark Baumgartner at the Woods Hole Oceanographic Institution. We monitor the presence of marine mammals from ocean-going robots using the sounds the animals make. The robots automatically detect those sounds, identify the species based on characteristics of the sounds, and report which species have been heard to scientists on shore via satellite in near real time. Visit any of the projects below to find out where the robots are and what they've been hearing lately. The robots carry the digital acoustic monitoring instrument or DMON, a passive acoustic instrument that is capable of recording and processing audio in realtime. 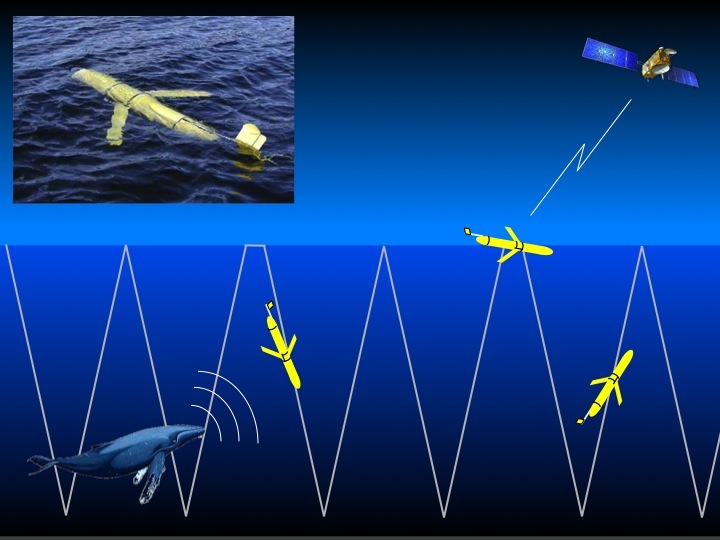 We have implemented a low-frequency detection and classification system (LFDCS; Baumgartner and Mussoline 2011) on the DMON to identify marine mammals calls from a variety of autonomous platforms, including gliders, profiling floats, and moorings (Baumgartner et al. 2013). The LFDCS produces pitch tracks of sounds with relatively high signal-to-noise ratios (> 10 dB above background). Pitch tracks describe changes in the fundamental frequency (pitch) of a call over time. Scientists typically examine spectrograms to identify marine mammal calls, such as the one below, and pitch tracks are derived from these spectrograms. Spectrograms are a method to visualize sound, and they describe how the frequency (pitch) of sounds change over time. They also describe the loudness or amplitude of a sound (in the spectrogram above, calls that are louder appear brighter). Very simply, the LFDCS seeks to "draw a line" through each call in the spectrogram. These lines, or pitch tracks, can be used to describe the call. The pitch tracks depicted below were generated from the spectrogram above (the colors indicate the loudness of the call; cooler colors are quieter, warmer colors are louder). Note that the calls shown in the spectrogram are easily recognizable by their corresponding pitch tracks. The LFDCS extracts simple statistics of each pitch track (e.g., duration, average frequency, rate of change of frequency with time) and uses quadratic discriminant function analysis to classify each call. Classification is based on a known set of calls contained in a call library that is defined prior to deployment of the DMON/LFDCS. Through communications with the robot, and ultimately with a shore-based computer via Iridium satellite transmission, the DMON/LFDCS remotely reports tallies of calls for each call type in its call library, as well as a subset of pitch tracks. Because of limitations in the amount of data that can be transmitted via satellite, the DMON/LFDCS relays a maximum of 8 KB of pitch track data every hour. What sounds are we listening for? From the North Atlantic, here are a few examples of the fin, humpback, right, and sei whale sounds that we can detect. Many are sped up to make them easier to hear ("24x" means the sound has been sped up 24 times). Many of the sounds large whales make are very low frequency and are therefore difficult to hear over computer speakers. Speeding up the sounds raises the pitch (frequency), which makes them much easier for us to hear. For each species, the clips above are of the same sounds, just sped up at different rates. To hear the sounds at 1x (normal speed), try using a great pair of over-the-ear headphones. 24x: Your browser cannot play this audio; please download the audio file. 1x: Your browser cannot play this audio; please download the audio file. 2x: Your browser cannot play this audio; please download the audio file. 4x: Your browser cannot play this audio; please download the audio file. These sounds were recorded on the Nomans Land DMON buoy between March 2015 and March 2016. You are welcome to use them; please credit Mark Baumgartner, Woods Hole Oceanographic Institution. Slocum glider: Slocum gliders (Teledyne Webb Research) operate by moving up and down in the water column using a buoyancy pump. The pump only operates at the beginning and end of a dive; therefore the vehicle is silent during descent and ascent, making it ideal for passive acoustic monitoring. Short wings provide lift and passively generating forward momentum during descent and ascent. Slocum gliders are capable of moving horizontally at slow speeds (< 1 knot), and their endurance is limited to 3-5 weeks when powered using alkaline batteries. They are equipped with oceanographic sensors, a global positioning system (GPS) receiver, and an Iridium satellite modem that allows two-way communication with a shore-side computer. The vehicle is navigated simply by providing new waypoints to the vehicle during Iridium communication sessions; the vehicle is capable of self-navigating to these waypoints by adjusting its roll and yaw to change direction. The DMON hydrophone is mounted externally in faired acoustically transparent polyurethane, so flow noise is negligible. Profiling float: APEX profiling floats (Teledyne Webb Research) also move up and down in the water column using a buoyancy pump, but they lack wings to provide lift and forward momentum. They therefore passively drift with the ocean currents and cannot be accurately navigated. To retard the movement of a profiling float, the vehicle can be "parked" at or near the bottom where the sub-tidal currents are typically quite slow, and the frequency with which they return to the surface to transmit data to a shore-side computer is kept quite low. Like the Slocum glider, profiling floats are equipped with oceanographic sensors, a GPS receiver, and an Iridium satellite modem, and the DMON hydrophone is mounted externally in acoustically transparent polyurethane. Wave glider: Wave gliders (Liquid Robotics, Inc.) consist of a surface float (resembling a surfboard) and a tethered "sub" that use the energy of surface waves to provide propulsion and solar-charged batteries to provide power for the navigation system, instrumentation, and Iridium modem. Like the Slocum glider, the wave glider can be navigated by supplying new waypoints during Iridium communication sessions. However, its endurance is theoretically unlimited, making it ideal for persistent use in remote and harsh environments over time scales of months to years. The DMON hydrophone is suspended several meters below the "sub" in a hydrodynamic towfish, and the hydrophone cable features mid-length floatation to decouple the motion of the vehicle from that of the hydrophone. 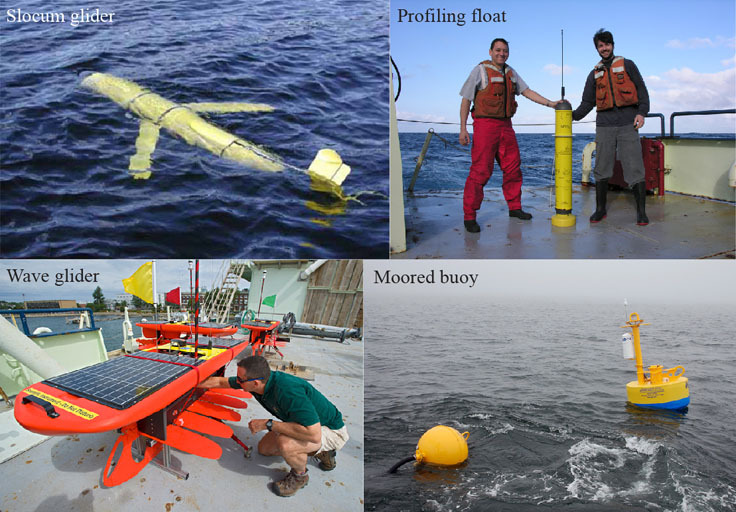 Moored buoy: The WHOI Mooring Group has developed a successful moored buoy design for a variety of acoustic applications. The DMON instrument and hydrophone are suspended at depth on the mooring line between an anchor and a subsurface float. This float, in turn, is attached to a surface buoy via a "stretch hose" with helical electromagnetic conductors embedded in the walls of the hose. The hose can stretch to nearly twice its relaxed length and is thus capable of decoupling the motions of the surface buoy from the mooring line below the subsurface float. This ensures a quiet acoustic environment for passive acoustic monitoring. The conductors in the stretch hose and electromagnetic cable allow (1) power to be delivered to the DMON from the alkaline battery pack in the surface buoy well, and (2) detection data to be delivered from the DMON/LFDCS to a data logger in the surface buoy. The data logger continuously collects and stores these data and eventually transmits them to a shore-side computer via an Iridium satellite modem on a pre-determined schedule (e.g., once every hour). Analysts are trained to review DMON/LFDCS data in near real time using a protocol so that results are standardized and consistent among analysts. Note that protocols are periodically updated. The protocol for detecting sei, fin, humpback, and right whales in the northwest Atlantic Ocean can be found here. If you are using the desktop version of the LFDCS, visit the LFDCS manual for more information. If you have any questions, please contact Mark Baumgartner at mbaumgartner@whoi.edu.